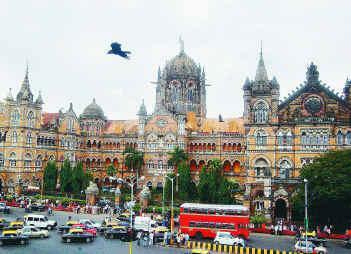 The Chhatrapati Shivaji Terminus is a magnificent spectacle among the skyscrapers of India's commercial capital, Bombay (Mumbai). The building was completed in 1888 under the guidance of F.W. Stevens, a British consultant architect. The Gothic-style building initially was named Victoria Terminus, but it was renamed Chhatrapati Shivaji Terminus after a hero who led resistance to the Mogul empire. The huge terminal building is filled with the heat and clamor that rise from its daily 1,250 trains and 3.3 million passengers.